1. Set a large frying pan over a medium heat and add the oil, pancetta, onion, garlic, chilli flakes, fennel seeds and rosemary. Cook for 10 minutes, until the onions are soft and the pancetta is turning golden. Add the wine and cook for a few more minutes, until reduced by 2 /3. 2. Add the tomatoes and part-cooked lentils; simmer for 25-30 minutes until the lentils are soft; season. 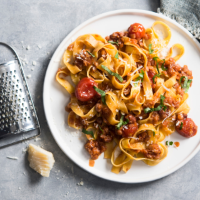 Meanwhile, cook the pasta according to pack instructions, then drain (reserving a mugful of cooking water) and add to the ragù, loosening it with some of the pasta water if needed. Top with the basil and parmesan, to serve. Wash 840g red lentils in a large bowl, rinsing until the water is clear. Put in a large saucepan with 2 unpeeled garlic cloves, 1 unpeeled, halved onion, 18 peppercorns and 1.9 litres water. Cover the pan and set over a medium heat; bring to the boil, then gently simmer for 3-4 minutes testing often, until some lentils are soft, but most retain a little bite. Drain and rinse with cold water. Discard the garlic, onion and peppercorns, then divide between 6 freezeproof bags or boxes. Store these portions in the fridge for up to 3 days and/or freezer for up to 3 months, as needed; defrost in the fridge overnight before using.